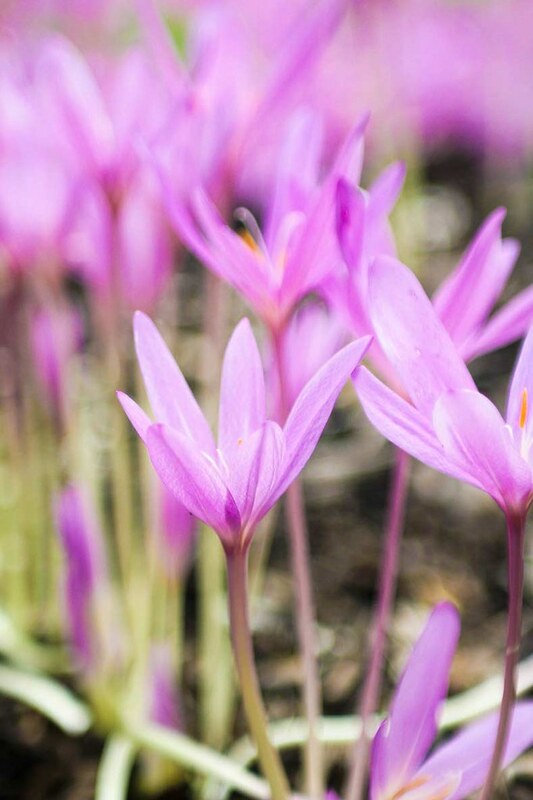 If you are looking for a getaway from the busy London or just want to spend a day out in nature with your family, then a visit to Kew Gardens is the perfect answer. I have created for you the perfect guide with all the attractions of the Royal Botanical Gardens and everything you need to know about where to buy your ticket from and how to get there, to make your visit easier. Kew Gardens is situated in the South West of London, in the beautiful neighbourhood of Richmond upon Thames. Being the largest UNESCO world heritage site in London and more than 250 years old, Kew Gardens is the home of the Millennial Seed Bank, the biggest wild plant seed bank in the world. The Kew Estate occupies an area of 121 hectares home to over 30,000 plants. 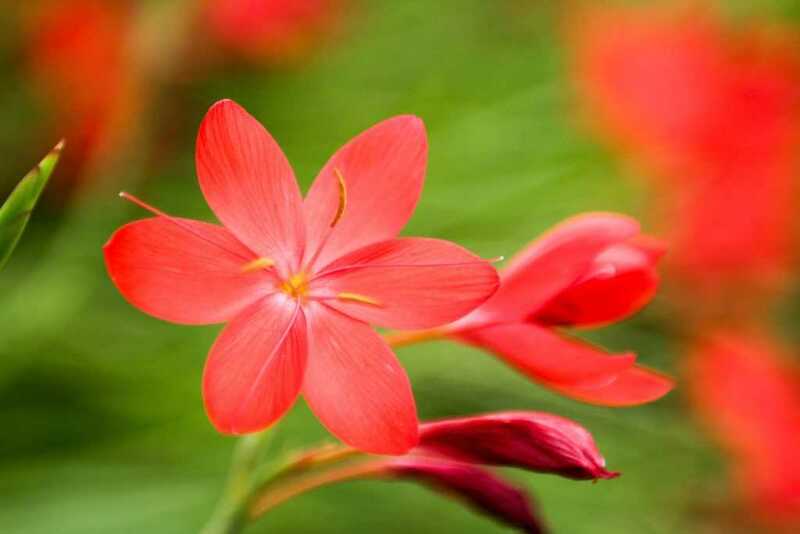 You can find here large flower and vegetables gardens, woodlands, lakes and ponds, conservatories, natural reserves and wildlife. Kew Gardens is open every day from 10am until 6pm (from the end of March until the end of October). For the rest of the closing times (due to the shorter days), you can check the schedule here. Kew Gardens is great to visit in any season, including in winter, when they have some amazing light shows. During the year there are several exhibitions and events that transform completely Kew Gardens. You can see a list with what’s on this season here. How long to spend at Kew Gardens? I would say a day is not enough and you would want to return if you want to see the entire Kew Gardens and palace. 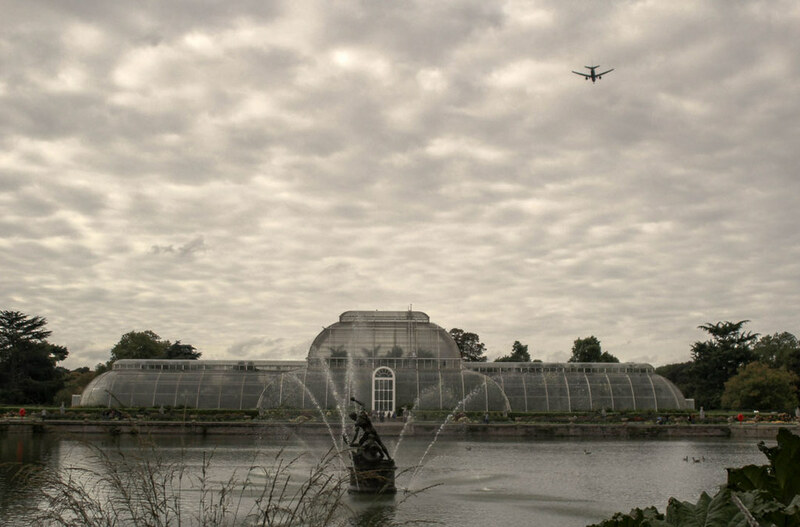 You can reach Kew Gardens very easy from central London by tube, the overground, bus or train. If you plan on traveling by tube, Kew Gardens is on the District line, in zone 3 (£3.30 one way with an Oyster or contactless card). The station is 500 meters from Victoria Gate. If you choose to travel by train, South West Trains run services from Waterloo station via Clapham Junction and Vauxhall (£4.40 for a one-way ticket). The train station is 800 meters away from Elizabeth Gate. Buses 65 (Ealing Broadway), 391 (Fulham), 267 (Fullwell) and 237 (White City) connect different parts of London to Kew Gardens as well. In summer, there is a boat service that runs from Westminster Pier to Kew Pier (500 meters from Elizabeth Gate). 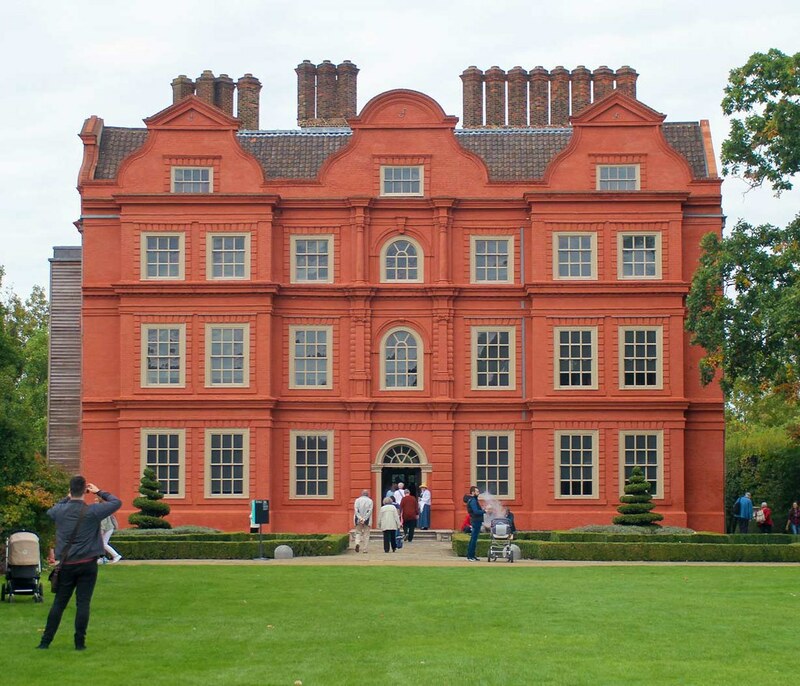 The cheapest place to buy your Kew Gardens and Palace ticket is online, where you can save up to 27% off the gate price. Not only that it’s cheaper but you will also skip the line at the gate, which in summer and during the weekends can get quite long. Click here to buy your ticket online. 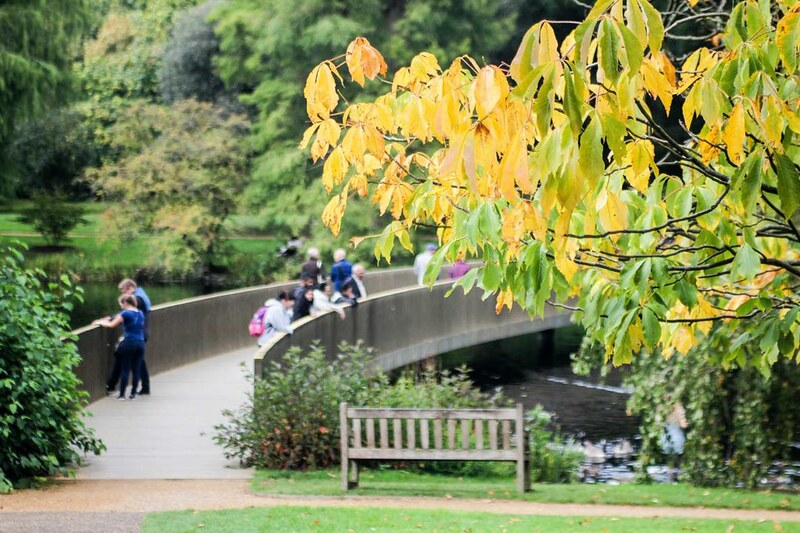 Even if you are looking just to spend a day out in nature, planning is essential when visiting Kew Gardens because of the big number of attractions and the large area it occupies. You will receive a map of the gardens together with your ticket, but to make things easier, you can also download it from here. Depending on the purpose of your visit, you will find some suggested routes on the map. However, I will tell you all about the attractions at Kew and how to organise your time so that you can make the most out of your visit. I have started my visit to Kew Gardens from Victoria Gate and headed to the attractions from the East, finishing in the West hours later. I did take my time and enjoyed the strolls through the different gardens and conservatories, chased butterflies (for photos) or gazed at the carnivore plants have their hourly “shower”. I’ve even met some of the permanent residents: a courageous fox, a few curious ducks, a mamma squirrel with 2 baby squirrels behind her and a lonely peacock. There are a few cafes and restaurants inside Kew Gardens but you are always welcomed to bring your own food is you prefer a picnic under the trees. The Hive is probably Kew Garden’s most ambitious project, a masterpiece of scientific research resulting in an incredible visual and sound experience. Stepping inside The Hive is like experiencing the inside of a real beehive, with all the sounds and lights triggered by the actual honeybee activity inside the Kew. This makes every moment inside The Hive different. 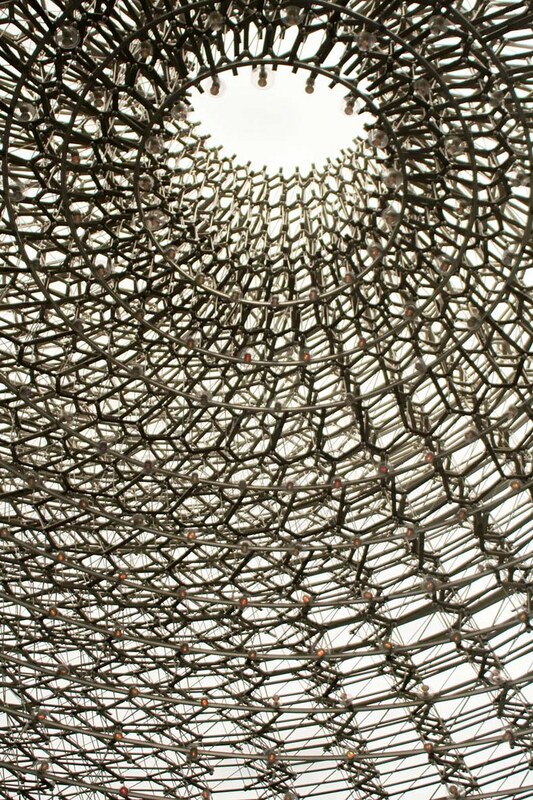 The Hive was first built for the UK’s pavilion at the 2015 Milan Expo, by Wolfgang Buttress. It is 17 meters tall, it weighs 40 tonnes and it is built from 170,000 of aluminium parts with 1000 led lights. Because it’s such a popular attraction, I would recommend making your way to The Hive as soon as you arrive at Kew Gardens (the earlier the better). It is a truly fascinating experience. 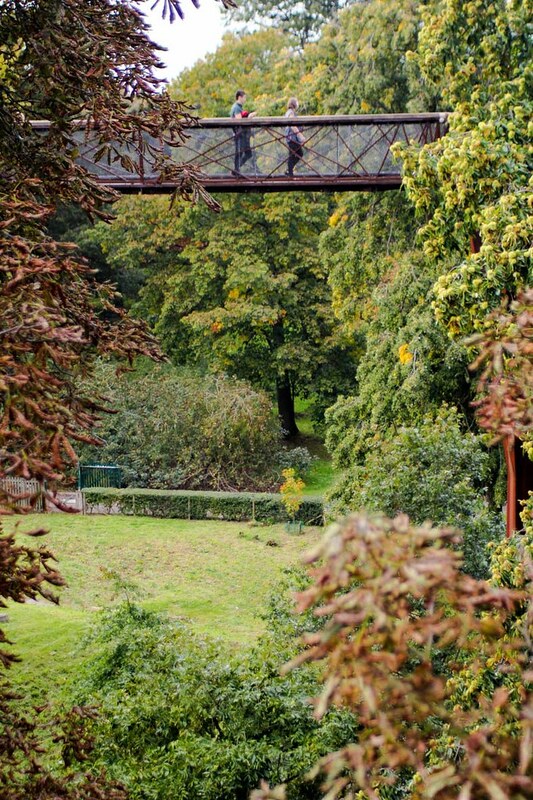 The Treetop Walkway is a very exciting “climb” for the entire family, especially for children. The metal structure is 18 meters above the ground, 200 meters long and sways in the wind. The views from up there are pretty awesome, over the forest canopy. Some parts of the walkway pass through the branches of the chestnut and oak trees, on which you can observe different birds and insects. The structure of the walkway was made in such a way that the rust made it look like it blends perfectly with the environment next to it. At the bottom you will find the Rhizotron, an underground laboratory where visitors can learn about how trees grow. There are 118 steps up to the walkway. Inside the Palm House you will discover a world of rare and even extinct plants (in the wild) that are growing here due to the efforts of the Kew scientists. You will find here trees that are at the base of many products that we consume every day: the rubber tree, the Cocoa tree, the Pepper tree (I didn’t even know that pepper grew in a tree! ), the sugar cane, the African oil palm or the coffee tree. The building itself dates from 1844 and it’s an iconic Victorian building made from glass and iron, resembling the hull of a ship. This is because the architects have used techniques from the ship building industry when they designed the glass house. The Alpine House is quite the masterpiece of architecture if we take in consideration that it was built in such a way that 90% of the ultraviolet light of the sun passes through to the plants, in has an automatic system of blinds that go down when the temperature is too high outside and the air is cooled down though a system of pipes underneath the building. There are over 200 alpine plants here, which is the wild are usually growing at altitudes of 2000+ meters. The Temperate House is currently closed for restauration and it will be opened sometimes next year, after 5 years of works. Inside the Temperate House there are collections of very rare and threatened species of plants. 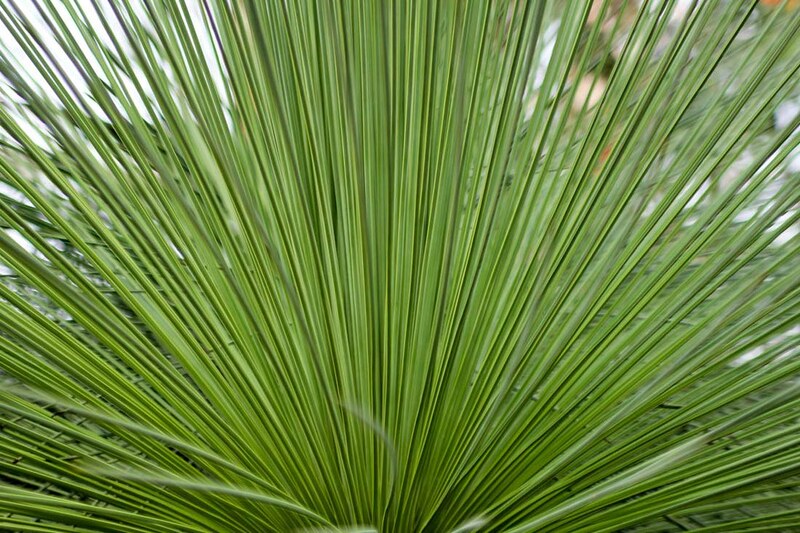 Some of the plants you will see here have been extinct in the wild and only live at Kew. Such a plant is the Encephalartos woodii (The South African cycad). Have you ever seen a giant waterlily? Me neither, before visiting Kew Gardens. The Waterlily house is the most humid greenhouse from Kew Gardens and is the home of many heat loving plants. 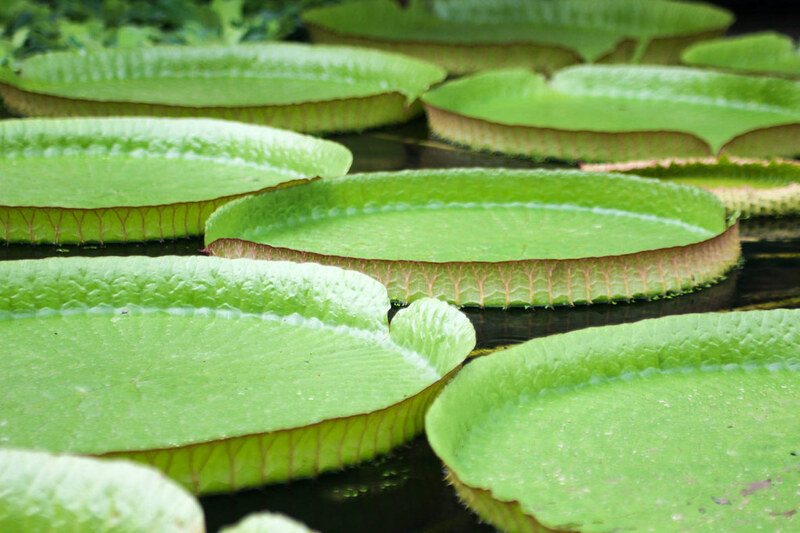 It was interesting to learn how the waterlilies from Amazon can grow so big that they can support a child’s weight. Of course, it is not recommended (or allowed) to let your child jump on them, but still it’s amazing how much strength these plants hold on their leaves. Stepping into the Princess of Wales Conservatory is like entering the jungle from an exotic destination, like Malaysia or Indonesia. The first thing you notice is the high humidity and the warm temperature. But no wonder, this conservatory is home to many tropical plants, cacti and orchids. 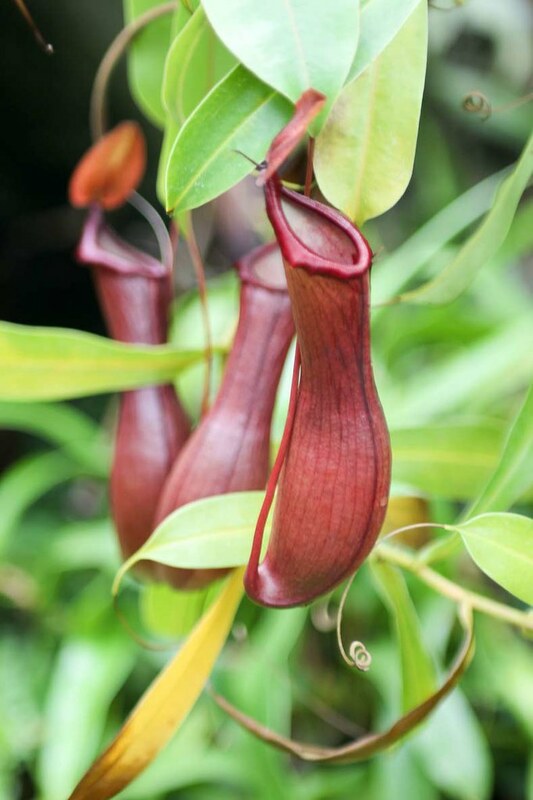 You will also find here a large collection of carnivore plants, out of which I recognised the Venus Fly Trap, which I once tried to grow in my own apartment. An interesting fact is that below the conservatory there is a time capsule buried by Sir David Attenborough, with seeds of basic crops, endangered plant species but also a few books on conservation. The capsule will be opened in 2085. One fantastic fact about Kew Gardens is that the trees planted here are cleaning the air in London, with over 8.6 tonnes of carbon dioxide absorbed each year. 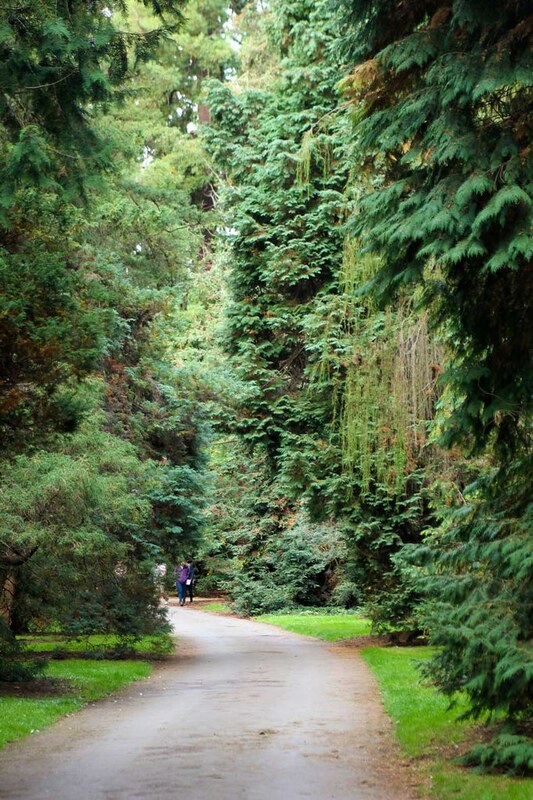 There are around 14,000 trees in the Royal Botanical Gardens, some of them as old as the garden itself, dating all the way back from the 18th century. The trees are planted in groups according to their species (over 2,000), with some very rare and ancient ones. The tallest tree at Kew Gardens is a coastal redwood, measuring 39,3 meters high, while the oldest ones are the Japanese pagoda tree (around 250 years old), the Lucombe Oak and the black locust tree. Strolling inside the oak forest made me feel that I was in a different place, not in London but Canada or somewhere in North America. This was one of my favourite parts of the garden to walk in. Even if it was autumn when I visited and not many species were still blooming, I enjoyed all the colours and the pretty butterflies flying from one flower to another. The plant family beds are found in any botanical garden in the world and represent the arrangement of plants according to their relationship with each other. The scientists at Kew have been researching about the way plants relate to each other through their DNA and molecular characteristics. Next to the Plant Family Beds is the Kitchen Garden, an area where fruits and vegetables have been grown all the way back since 1759, for King George III. 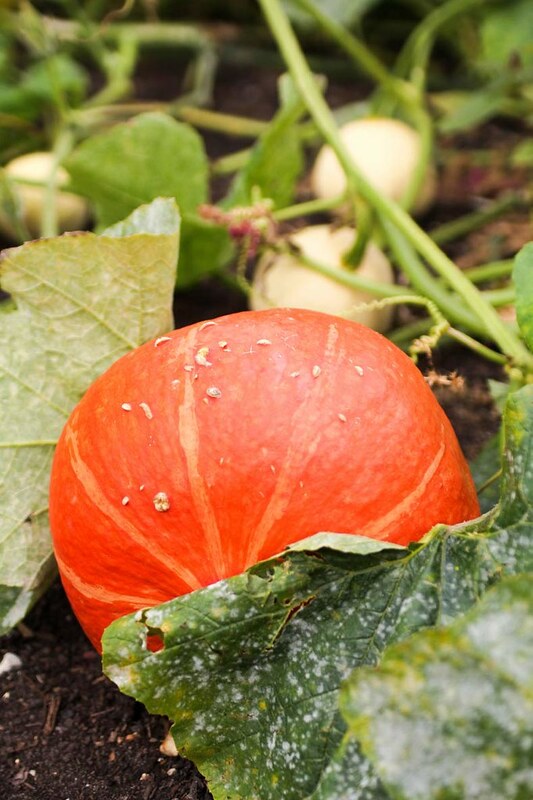 Today there are over 250 different fruits and vegetables growing in the garden. I was delighted to see apples, pumpkins, a few giant cabbages and some turnips. I didn’t really know what to expect from the Rock Garden until I found myself going downhill, through a path surrounded by colourful plants growing on high sandstones. The rock garden is a representation of the Pyrenean mountain habitat, a 150 meters valley with the path passing through simulating the course of a river. 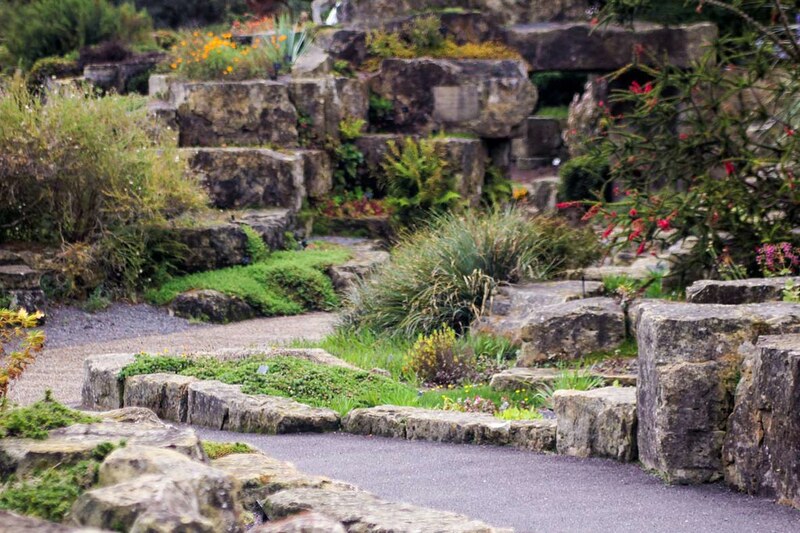 The rock garden is the home of over 3,000 alpine plants originally from Europe, South and North America, Asia, Africa and the Mediterranean climate, Australia and North America. Kew Palace is the smallest British royal Palace and it is best known as the temporary “refuge” of King George III, the place where he was locked during his “madness” period. Beforehand however, the palace was used by the King and his family as a summer residence. The Palace was built in 1631 but a Dutch Architect and this is why it looks like a piece of Netherlands on UK soil. If you look closely over the front door, you will notice a lover’s knot with the initials C and S on it. They stand for Samuel Fortrey, the Flemish merchant who built the palace and his wife, Catherine de Latfeur. The symbol of their love stands there even 400 years after their death! Currently the Palace is closed for winter. In the rear of the Kew Palace you will find a charming little garden with plants that used to grow in the 17th century. Most of them are medicinal plants and on the label next to them you will find what they were used for and a quote from an herbal book. King George III has built this cottage for his wife, Charlotte, in the 18th century. The cottage was used as a resting place during their walk and had a small menagerie in the back where exotic animals like kangaroos or black swans were held. Towards the back of Kew Gardens, after walking through the beautiful quiet forests, in the middle of the bamboo garden you will find the Minka House, an original traditional Japanese farmhouse. The house dates from the early 19th century and it was used by Yonezu family from Okazaki City, in central Japan. 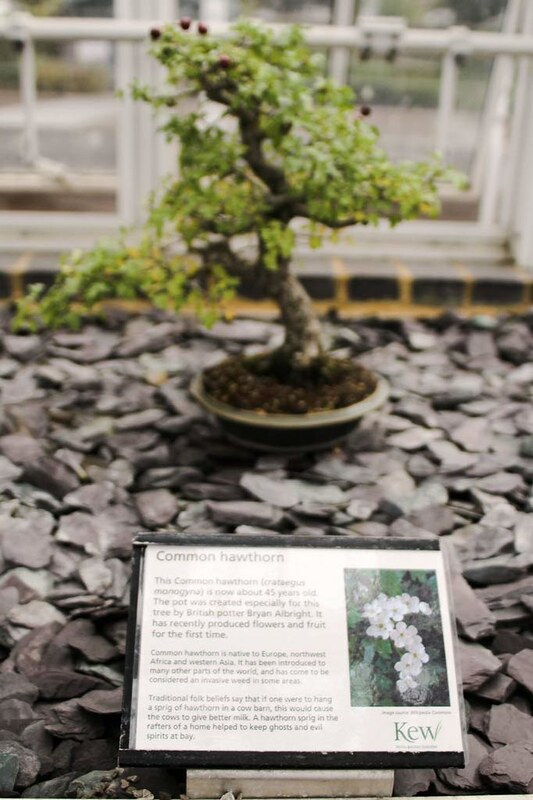 It was donated to Kew Gardens after the last member of the family died. The Minka houses were used by farmers, merchants or artisans and they were built with a low roof to protect them from rain and snow but also to keep them shade from the hot summers. They were divided into 2 areas: the floor of compacted earth and a raised platform for sleeping, with a built-in hearth for cooking and heating. The Bamboo Garden is one of the UK’s largest collection, with around 1200 species growing around the Minka House. Unfortunately, the Pagoda was still under renovation when I visited Kew Gardens but rumours say that it’s supposed to open again to the public next year. The Pagoda has been built in 1762 as a copy of the Chinese Ta. Back then it was such an unusual building in Europe that people didn’t believe it would stand up for long. However, it did and now the 10-storey high tower is one of the garden’s landmarks. The pagoda is decorated with 80 wooden dragons and covered in ceramic tiles. A local tale says that the dragons used to be made from gold but have been sold by Kind George IV to cover his debt. Historians say that this is not true, the dragons were carved in wood from the beginning but overtime, they have rotten. Next to the Grand Pagoda you will find the beautiful and peaceful Japanese Garden, split into three areas: The Garden of Peace, The Garden of Activity and The Garden of Harmony. All three are leading up towards the Chokushi-Mon, a four-fifths scale replica of the gate from Kyoto’s Nishi Hongan-ji temple. The Garden of Peace is created to resemble a traditional Japanese garden, with stone lanterns and a dripping water basin. The Garden of Activity symbolises the world, with elements reminding us of the sea, the mountains and the waterfalls. Between them stands the Garden of Harmony, linking them through shrubs and tocks representing the mountains of Japan. Crossing the Sackler bridge I couldn’t not notice the beautiful reflections of the autumnal colours of the trees, in the water. It looked like the two entities are blending into each other, not knowing anymore which is the lake and which is the land. This is because the trees surrounding the lake are Chinese tupelo, known for their dramatic colour change in autumn. The Slacker Crossing is made out of black granite, with bronze posts which from a distance give the impression of a solid wall. The bridge crosses the lake in an S shape, mimicking the rounded banks of the lake. If you are wondering what a rhododendron is, you are not alone. I was asking myself the same thing while looking at the map of Kew Gardens and wondering if I should make my way all the way to the other side or now. To answer the question, yes, do make your way up there because rhododendrons are beautiful woody flower shrubs which grow up high in the mountains. The most common of them is the azalea, a flower we all know. The rhododendron represents over 1000 different species of plants, out of which you can find hundreds at Kew Gardens. 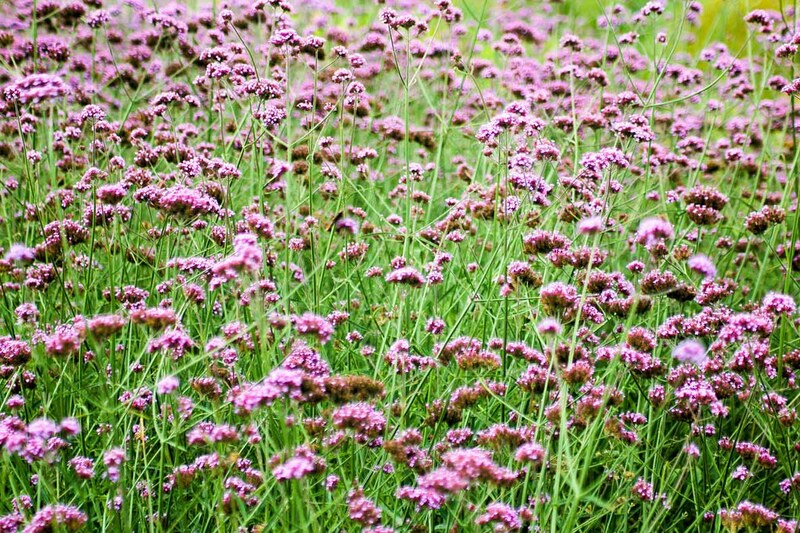 They are best seen in late spring, when they are all in full bloom. The original temple of Aeolus was built out of wood on an artificial mound, offering beautiful views over the gardens. However, by the middle of the 18th century it has been rebuilt in stone because the wood had rotten. The temple was dedicated to the Greek God of Winds. The temple is surrounded today by oaks and maple trees and led to by a path through a carpet of primulas and blue poppies. This gallery is dedicated to Marianne North, the daughter of an MP who travelled alone in South America, Asia, South Africa and America to paint plants. Back in her days it was very unusual for a woman to travel alone. The gallery has 832 paintings, all belonging to Marianne North. Next to the Marianne North Gallery you will find the Shirley Sherwood collection of botanical art, one of the largest in the world. The oldest piece is in the museum dates from 512 and represents an illustrated copy of the Dioscorides’ de Materia Medica, a book written between 50AD and 70AD by a Greek physician from the Roman army, Pedanius Dioscorides. Disclaimer: This post has been written in collaboration with Attraction Tix. ← How do I get compensation if my flight is delayed? Thank you for this really detailed guide on visiting Kew Gardens, you’ve really covered everything! It’s been a while since I was there, so this is so handy to have. I’ll definitely book online as you get 27% discount! I like the treetop walkway, and the Japanese garden seems so peaceful, just my kind of place. I work right by Kew Gardens but still haven’t been. I’m determined to make it come spring. What a beautiful place! Your photos are amazing too! I love gardens and seeing all the different flowers. This looks like a great one to visit! The photos look beautiful don’t they – really make you want to go and visit as soon as you can. Wow what gorgeous photos! It looks like an amazing place to visit and even more amazing to photograph! Wow, what a gorgeous place to visit. Everything looks beautiful and calm. I sure will be visiting this awesome garden, when I am in London soon. 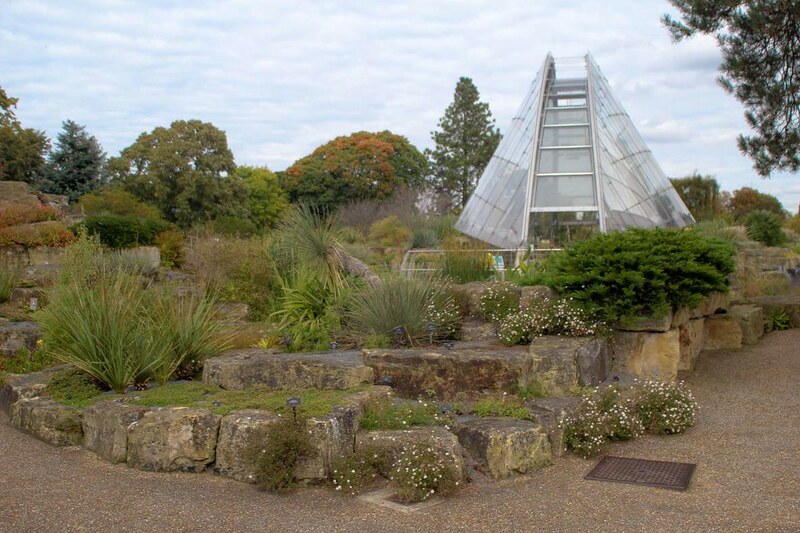 I have heard so much about Kew Garden but it isn’t somewhere I have ever been, it looks absolutely amazing though, all those wonderful plants and the wildlife to see! I had no idea Kew Gardens was anything more than just a small pretty garden! Your photos are wonderful and I now need to go ASAP! I can’t believe I had no idea even though I’ve lived in London for 6 years! Thanks so much for the guide! What a beautiful place it is. I have been to London few times but never been to Kew Gardens. The way you have explained everything and all the pictures make it more interesting. Moreover, it is a Unesco heritage site, I am definitely going to visit this next time I am in London. I always wanted to go to London, and hopefully may sometime in the next few years. I had not heard of this place yet, but I am definitely putting it on my list of things to do! Thank you for the information, and gorgeous photos. I wasn’t aware that Kew Gardens is a UNESCO site. Have been there as a kid years ago, and remember the flora and fauna truly being magnificent. 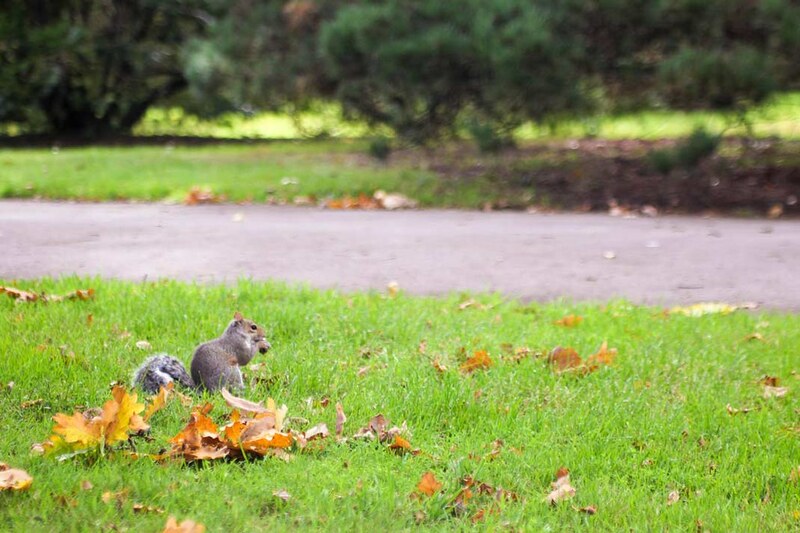 I have always loved these “little” patches of green that the British so love to place in Cities – they have similar gardens in Birmingham where I stay a lot – and these make for a perfect day out for the whole family – a little bit of education and entertainment mixed into one. Thanks and it’ll be so nice to re-visit the place this time with my kids. I didn’t realise KG had downtime you know, looks like I’ll be waiting til next year to visit. I’m sure it would be worth it though! Wow, this is an amazing list. Such wonderful places to see, and what awesome pictures to go along with it. I’ve never been here, but it looks really beautiful!! When I think of London, I always think of Oxford street and red buses. Never thought you would find this type of garden in that city, such a nice surprise. I think the waterlily houses would be my favorite to check out. They’re so interesting to look at. I’ve never been to London but when I do I definitely have to visit the Kew Gardens. The pictures are beautiful! Wow it looks like a place out of a storybook. I love that you saw a fox too. I hope to get across the pond one day to visit all the amazing places in Europe. Holy smokes, that’s a lot to see! The Hive and the tree top walk look cool. It would be cool to see the Pagoda and the rock garden as well. Wow. I have never been to london before but when i do Kew Gardens is one place i would love to visit. I like the hive and the tree top walk way. I can imagine how great it is to see in person. Coincidentally I saw the kew gardens photos last week only as my sister has recently moved there and exploring the places nearby. I literally felt like I was taking a relaxing stroll through the garden with you! I think I’m going to have to save this to my London board on pinterest so I make sure to visit this place when I go to London this next year. I really like the bit you put in here about how to get there as navigating transportation is difficult for me, lol. Your photos of the plants are astounding! I particularly love the one with the waterlilies, nature is so fascinating, those look like you could pop them out of the water and have a meal on them don’t they! Love all the green and fall colors! Beautiful blog post! London is my favorite city I’ve ever been to. Kew Garden looks like an amazing and beautiful place to visit. There is a lot of interesting places that captured my attention like The Arboretum and The Sackler Crossing. What a thorough guide. I can’t believe I missed this garden when I was in London last year. This is exactly the kind of place that I love. Kew Gardens looks amazing – with all the beautiful flowers and interesting animals. I wish that I had time to visit it when I was in London. I’m going to definitely add it to my itinerary for my next visit. Wish I knew about this place before my recent visit to London. I didn’t know that there are so many attractions close to Kew Gardens. I loved the Hive the most. It looks so trendy. It is so nice that their initials are still there on the front door after so many years. These are such stunning photos. What an amazing area. I would love to walk through this place. It looks like a great area to sit and read. I’m so sad I missed this while I was in London! Although it was in January, so it’s probably better that I go during a nicer season 🙂 Beautiful photos! Wow who would say that place like this exists in the middle of London. This is actually the first time I have heard for Kew Gardens and I am absolutely astonished. This place really looks amazing and I am really wordless. This is something I have to see next time I visit London! I’m so glad that I read this, it’s a very thorough guide! I haven’t been to Kew Gardens since a visit in school and am desperate to get the chance to visit again soon. I always think of Kew gardens as an oasis in a mad city. The Hive sounds incredible – thanks for the tip to get there early. The treetop walkway looks very scary! I agree with you Helen. It would be nice to go there to escape city life for a while and enjoy the scenery. You’ve made me feel like such a bad Brit! Haha! I’m not a Londoner, but have spent a fair bit of time in the city and I’ve still never made it to Kew Gardens. On my next trip – I’m going to make it happen, I promise! Also, that little ‘Breakfast Club’ link up at the top caught my eye (probably because I adore that movie) and I literally *love* this idea! Totally going to come back here for more foodie/brekkers inspiration in the future! I love this so much!! Definitely like visiting gardens, makes me just relax! Was that really a fox on the grounds?! Wow! This looks like a beautiful place to visit! Your photos are absolutely amazing! I love your photos. It’s been a few yeas since I was last at Kew and would love to return. The flowers at Kew garden looks so nice. I wish I can visit this when I’m in London. Thanks for the great photos! The Kew Gardens is absolutely breathtaking. It reminds me so much of our gardens here on the west coast. So full of color and life. I’ll be sure to visit there on my next trip to London which I hope is soon! Wow, this is definitely not what you think of when you think of London, but it’s such a gorgeous place! Had no idea it was a UNESCO site, either. Thanks for this detailed guide, will have to check it out next time I’m in London! My friend was visited this kew garden last year and she mesmerized and adore this kind of nature. There is a lot of interesting insight that captured my attention like The Arboretum and The Sackler Crossing. 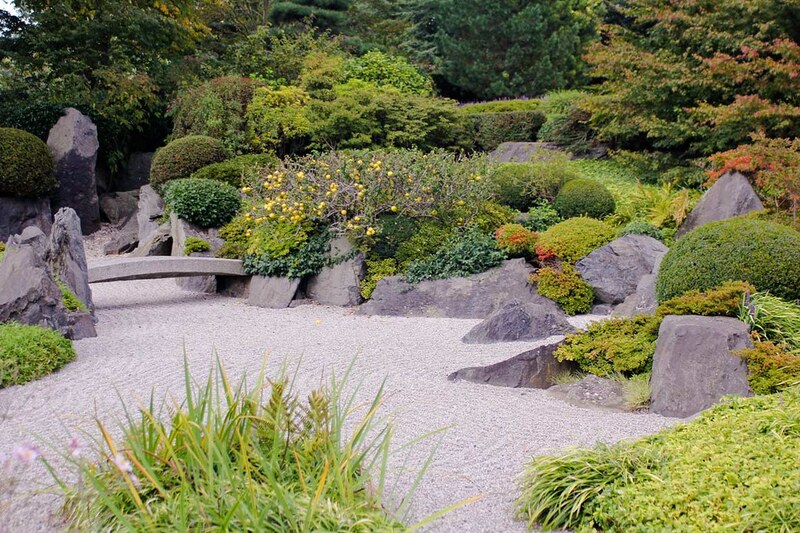 Especially the Japanese garden. The peaceful and calming ambiance is so amazing. Such a detailed guide! I had no idea Kew Gardens even exists, despite being from the UK. I think the Hive or the Waterlily House would be my favourite! I just love waterlilies – I saw some in the wild once and, you’re right, they’re absolutely incredible! There were quite a few animals that would sit on them, and it was crazy just how much weight they must have been holding. What an incredible place. I did not know that Britain had the biggest seed bank in the world. That’s quite a cool record to hold. I’m also very impressed with the hive. Some very clever people they had to have been to design something like the hive. The Alpine house was also cleverly designed which is really cool, having the blinds and underground cooling system. The hive and treehouse walkway look absolutely amazing. I’ve heard of Kew gardens once before, but never seen it presented in such great detail. Thank you for sharing you experience along with the beautiful images. I visited Kew Gardens with my family when I was 14 years old and this post brought back so many memories! It really is such a special and beautiful place. I loved the tropical house so much. Thanks for sharing! Wow! What a beautiful place. Those pictures are amazing! Those water lilies?!!! So cool! That looks like a photographers dream. I’m not a photographer, but I think even I might be able to take some good shots with such fantastic inspiration. Being one with nature is such a great opportunity to unwind and relax. If you’ll ask me, I prefer it more than visiting the mall and the like. If only I have more access of nature near our place, for sure I will always be there. All your photo screams oneness with the worls. I hope I can reconnect with the nature soon. Your photos are so beautiful! I had no idea Kew Gardens was a world heritage site, but you can certainly see why! I used to go there on school trips but I bet it’s changed so much – I’ll have to go back! So many different things to explore in one space, and such an amazing history. Kew Gardens really is a treasure! Was that a fox over there? Everything in this place is truly calming and very nice. This place truly deserves to be a World Heritage Site. I seriously wish that I could and experience the place for myself as well! I simply love your experience about that quiet stroll. 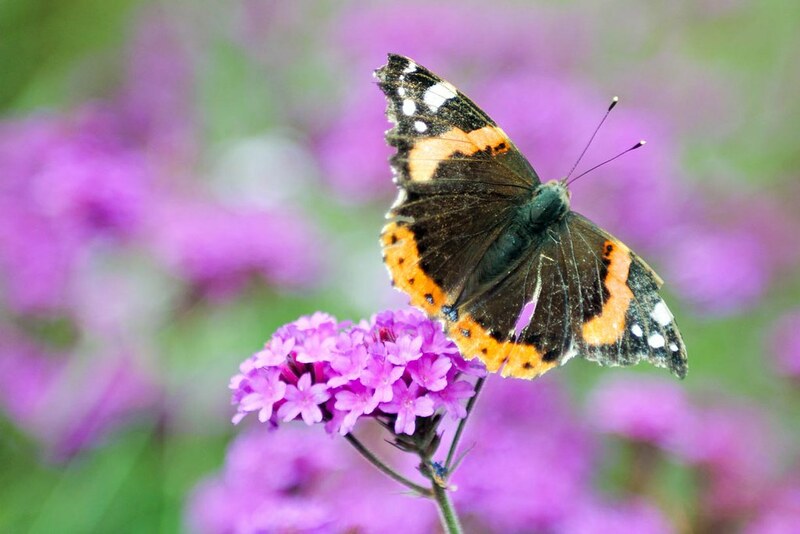 As gardens alone can calm my soul, chasing butterflies is something thrilling. Meeting a few locals, perhaps exchanging glances is a welcoming treat but what is more amazing is coming face to face with a courageous fox. Also, I only imagine how it is to share a few minutes with some ducks, squirrels and a peacock. Ooo whenever I’ve thought of London, I never really thought of visiting a garden. But now I really want to visit it, especially because of the bee hive. Its such a unique concept. I would love to visit the Kew Gardens. In fact, we’re planning a Euro trip (including London) in 2019. It has been a dream to visit all the UNESCO world heritage sites — though, we know it’s not possible but we’re trying to see as much as we could. Good to know that there is such a beautiful green patch close to London. I always thought it to be full of high rise buildings. The Japanese corner in the garden is really cute. I think that theme is adopted by all big gardens in the world. The insectivorous plants are amazing, great capture of details. Saying that place is beautiful is over rated.. I think this garden is more than beautiful. The way they maintained and cultivate the whole place is splendid, romantic. And dreamy. Thats a pretty detailed guide. Loved the pictures too especally of the hive! Its surely award grade! wow I have never seen a huge garden like this! It is almost like a paradise filled with various flora and fauna! I love how they sort the garden and group the plants based on their kinds or specie. Also the landscape is truly impressive. The giant waterlilies will surely put me in awe. I saw a couple of images online and they can even carry a human which feels like you’re thumbelina or something haha. What a great article! We lucky to live nearby so we often pop around and can’t wait for the. Christmas lights. Loved your photos. I never got to Kew Gardens when I was in London so I suppose I should add it to what to do next time. I would love to see the Hive and the Palm House. 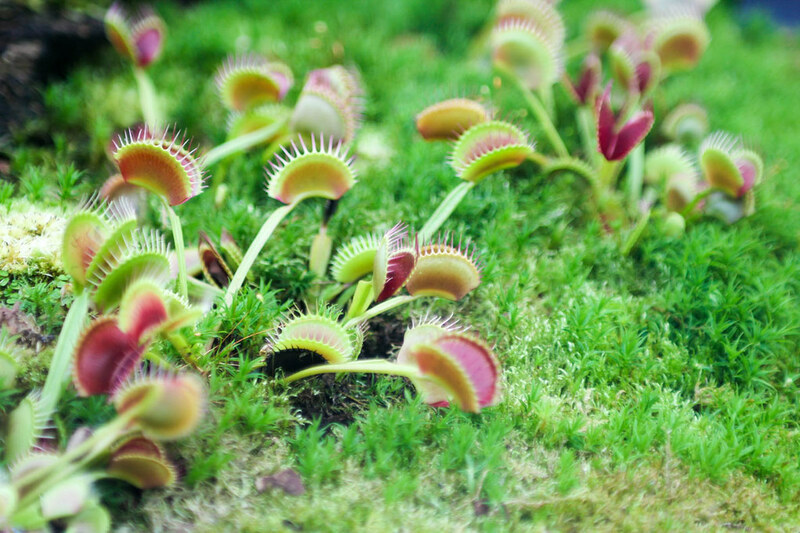 Although Venus Fly Traps freak me out. And I wouldn’t mind being locked up in that palace! It all looks very lovely. Been to London twice but never heard about this place ..pictures look so amazing n tempting me to go here in my next trip for sure. What a beautiful place. I have never been there before, but it is definitely on my bucket list now. Maybe we can get there one day, thanks for sharing! 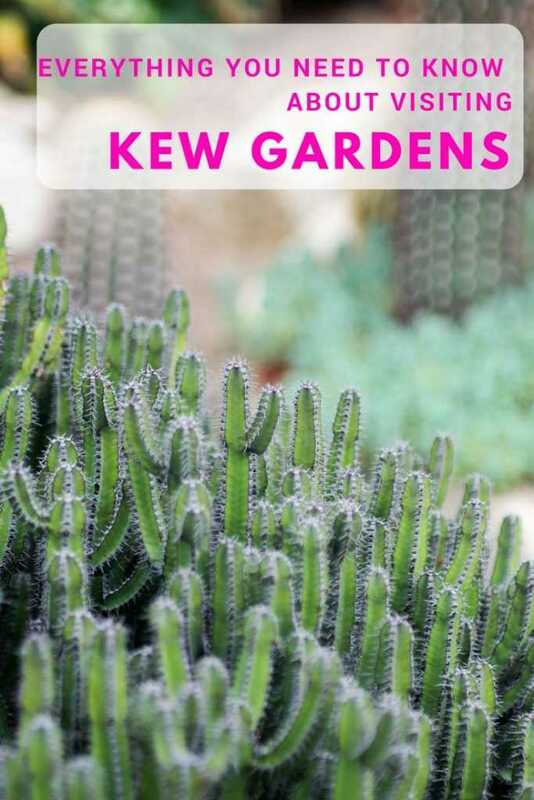 What a comprehensive guide, I am no gardener but there is something about wandering around gardens and taking in all the sights and sound of nature, Kew sounds like a great place to visit. My goodness, Kew Gardens is absolutely beautiful. I love how you shared the experience through this post. Beautiful post and stunning photos. Great job. Visiting London is on my bucket list. The gardens look so lovely! This place looks so exquisite. Your flower pics are amazing. 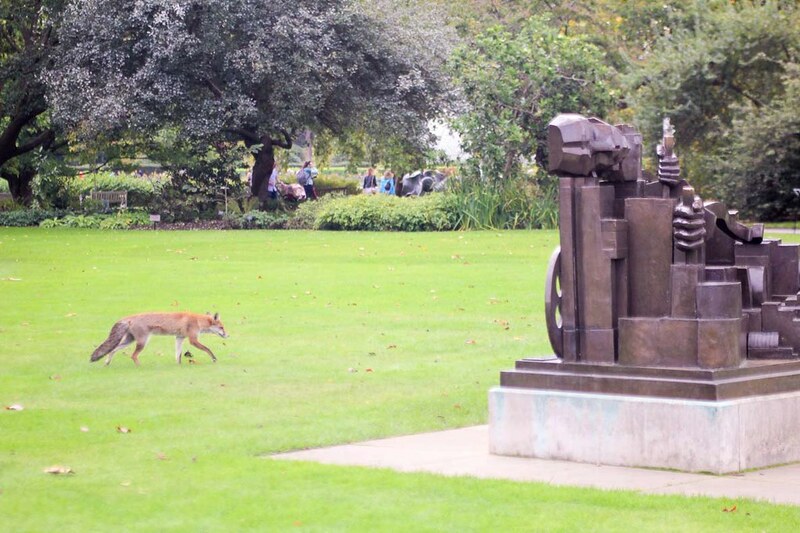 I loved the pic of the fox trotting on the grounds! I love this treetop walkway.It seems like a really beautiful park to visit.These flowers and nature captures are beautiful.Definitely worth visiting with kids. 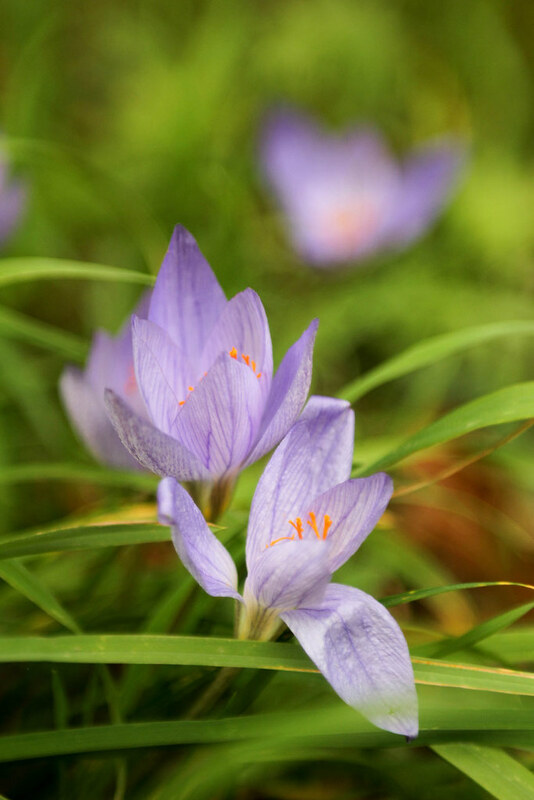 the water lily picture is my best , wow the nature photography so refreshing, I am sure to visit this destination. Oh it looks amazing and there is so much there compared to when I last visited. On my list of places to visit now. I haven’t been to Kew Gardens for years but your photos are making me want to go back with the girls! It’s so beautiful isn’t it. I had no idea it was a world heritage site and that it was more than 250 years old. We are so lucky to have it on our doorssteps. Kew Gardens looks stunning! Your photography is outstanding and you captured the beauty behind it so well. I’ve only been to London once and unfortunately, I missed the gardens. I will have to visit on my next trip. I have spent lot of time in London but could not visit this heritage. But delighted to see through your eyes. Wonderful post. Omg wow! I am so sad that I missed this when I was in London because it seems so easy to get to and like an amazing day out. Would love to check out the treetop walkway and tbe hive. Both seem super cool, along with everything else. Thanks for a great post!! This garden looks like it is so beautiful. I love visiting places like this and seeing all the pretty plants and flower colors. LOVE this post! We visited Kew Gardens on our last trip to the UK and had an absolutely wonderful time. I didn’t realize how huge it was though! We definitely will go back on our next trip. There’s so much to see! London’s next on my list!! I’ll be sure to go here. It’s my first time hearing about Kew Gardens. If ever I visit London, I definitely will include this in my bucket list especially when I’m with my mom since she is a nature lover. I love The Hive and I would love to walk on the Treetop Walkway. Thanks for such a detailed guide and you take stunning photos. I think London would be an awesome place to visit. I never even knew about these Kew Gardens this is a must now. I adore Kew Gardens and am well overdue for a visit, as we’ve actually not been since The Hive was installed! We used to go quite often… I love the glass houses in particular, and the rock garden, and it’s always amazing to see from the top of the walkway! I’ve lived in London for six years now, but I’ve only been to Kew Gardens once! I really enjoyed it though, so need to go back asap. 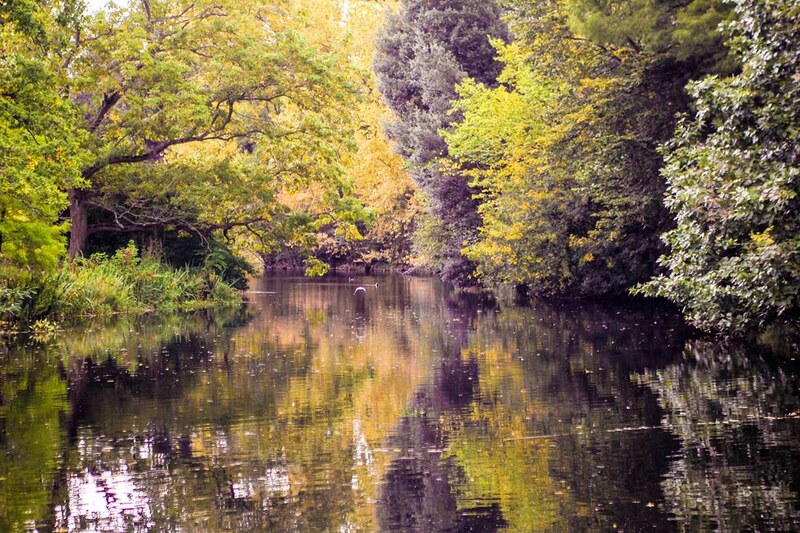 The thing is, there are so many beautiful parks in London, we’re spoilt for choice! Great post. Those photos are stunning. I don’t live in London but I can’t believe that the amount of times I’ve visited I’ve never headed to Kew. Kew Gardens really is beautiful. I still have pictures from when I visited about 14 years ago, but was a bit too young to fully appreciate it. I wish I’d had the time to revisit when I went back to London last year. Such a peaceful setting! I’ve never heard of this place but it looks so serene and beautiful! Can’t inagine this lovely place in the middle of the busy city that London is. I particularly like the treetop walkway and the water lilies look amazing! 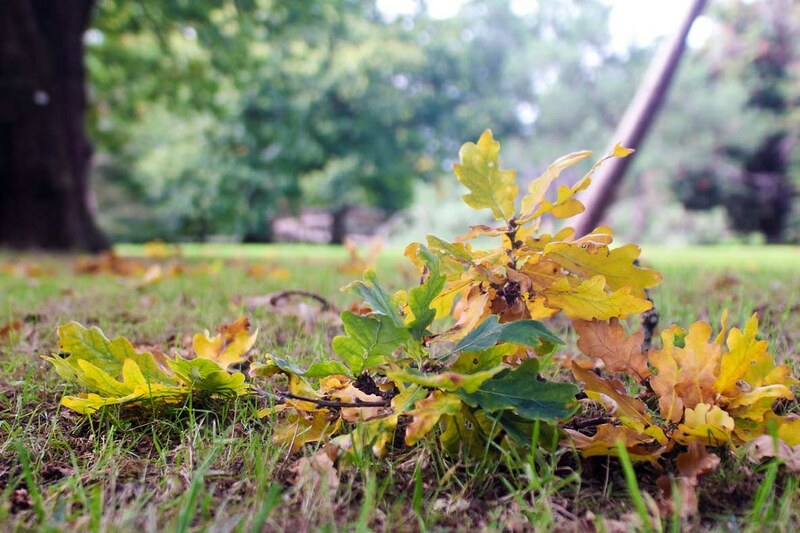 I’m so bummed we missed Kew on our trip to London – it’s definitely on the list for our next visit. Great photos! Wow Kew Gardens look STUNNING!! I would so love to go but they are quite a trek for me in Lancashire. What beautiful photos! Oh, how much I enjoyed these photos. This is such an amazing place to visit. A great post, and a story behind it! Its so nice to visit some places like this. Peaceful and relaxing. London is on our bucketlist and we will definitely find this place there. This looks like a beautiful place to visit. If I am ever in London I will have to stop by. I live just a few miles up the road from Kew Gardens and haven’t been since I was a young child and barely remember it (entrance cost 1p back then! ), however we are visiting this weekend and very much looking forward to it. I’d forgotten just how enormous it is. My late aunt worked there pressing flowers which she loved. Your guide has been useful in deciding what to see during our visit (basically as much as possible but definitely The Hive, treetop walk, Pagoda, Palace etc etc). Think we could do with two whole days! Your pictures are wonderful and I’m sure I will be taking many this weekend. Anyone wanting a lovely lunch or proper afternoon tea whilst visiting the gardens, there is a gorgeous olde worlde tea room across the main road called Newens (Maids of Honour) that I highly recommend. It gets very busy though as it’s so popular with tourists and locals alike. By the way, anyone thinking Kew is amidst the hustle and bustle of central London, it isn’t, it’s on the outskirts, in suburbia ;). There are many beautiful, open green spaces in London and its suburbs.